Somewhere around 1994 I walked into my first comics shop. I and my friends had traveled to the nearest college town to visit the arcade and go to the movies, as our little country town had next to nothing to entertain a bunch of kids on a weekend afternoon. I was a high school freshman, a geeky girl from a town where girls were supposed to be more interested in beauty pageants than the X-Files, and I’d just discovered Dungeons and Dragons. I had also begun to admit to myself (though not fully accept) that perhaps I was just as attracted to Gillian Anderson as Jonathan Brandis. The shop was welcoming to me (an experience that I know many girls aren’t lucky enough to have), and while my friends checked out action figures and RPG manuals, I headed straight for the comic books. I spent every bit of the babysitting money I had saved up on Uncanny X-Men and Excalibur, and from that point, I was hooked. I became very proud to refer to myself as a “Marvel Girl.” I even, later, introduced myself as such in college when I finally met some other girls like me – girls who enjoyed comic books and video games and science-fiction. Marvel Comics were among the things that helped me learn to accept who I was – largely through the mutant-related story arcs of the mid-90s. I didn’t venture out of mutant-related comics until later, when I began to venture into the larger Avengers-adjacent universe. For a large part of my life, I spent a significant amount of money on Marvel comics. To this day I subscribe to several. I loved Matt Fraction’s Hawkeye so much that I bought it in three different formats – digitally, individual issues, and then again in trade paperbacks. What Marvel is doing to Captain America right now is nothing short of sacrilege. They can say that Hydra is not a Nazi organization as much as they like, they’d still be wrong, even without using iconography and uniform styles that are, well, Nazi iconography and Nazi uniforms. 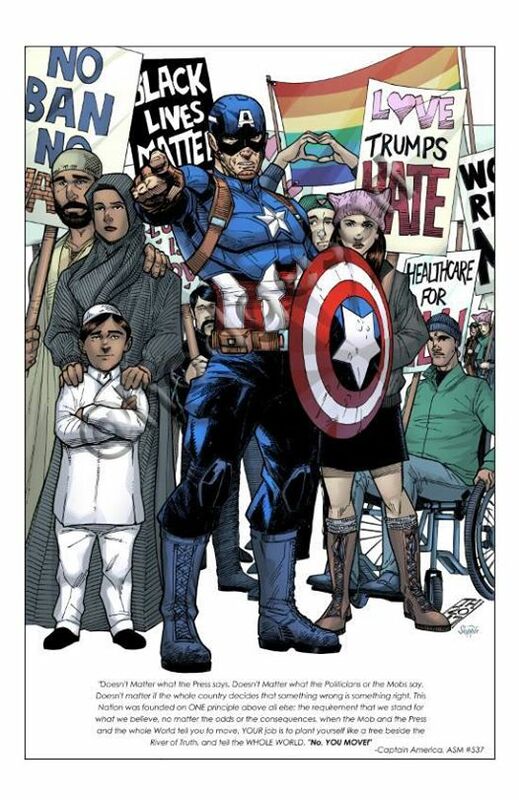 This is a character created by a Jewish man whose first appearance on the cover of a comic book was of him punching Hitler. Part of me wishes that we could resurrect Jack Kirby so that he could march into Marvel’s offices and do the same to Nick Spencer. I can’t, however, in good conscience suggest an outright boycott of Marvel comics, because there are good creators working there, writers and artists who are just as horrified as I am at the way this iconic character is being destroyed. There are diverse books that I do want to continue to support. So that’s what I’m going to do. I’m canceling all of my subscriptions EXCEPT the ones featuring diverse characters and anti-bigotry themes. And I’m leaving this here as my moment to beg Marvel to return Cap to the icon of hope for the disenfranchised that he was always meant to be. He hates bullies, he shouldn’t be forced to become one.